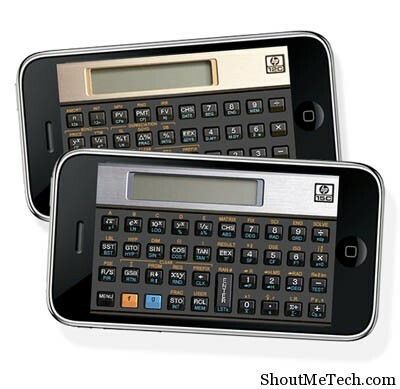 Calculators are an essential part of our daily lives and we need them regularly. Also, it’s not possible to carry a calculator with you all the time, nor can you use your phone to perform crazy scientific calculations. However, there are many online scientific calculator that can be found on the internet and used online. Normally, you do have access to internet almost everywhere you go. There are internet cafes, Wi-Fi hotspots etc, where you can get online and use one of these services to get out of a tight spot. Scientific calculators are different from regular calculators and are used by people who are looking to solve complicated mathematical or other kinds of problems. 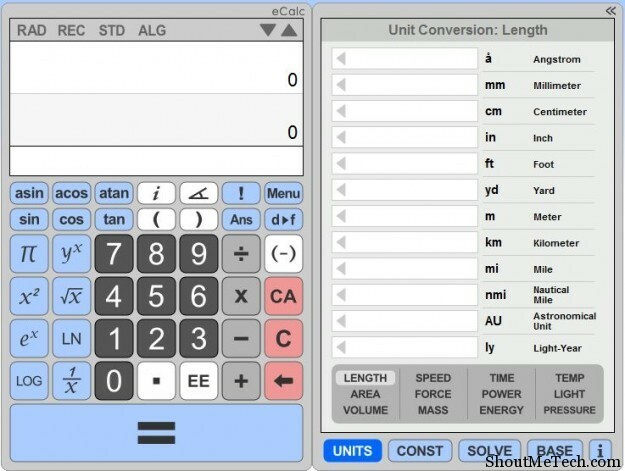 There are many types of scientific calculators available on the internet, some that are easy to use and others that are complicated and useful for higher level of problem solving. 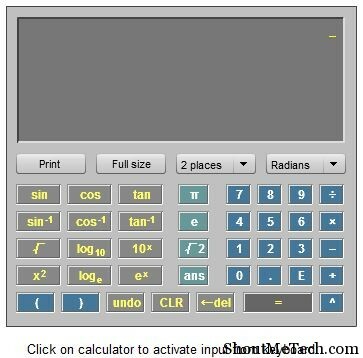 An online scientific calculator can sometimes be a life saver for users because of the fact that it can accessed from anywhere, anytime with an active internet connection. 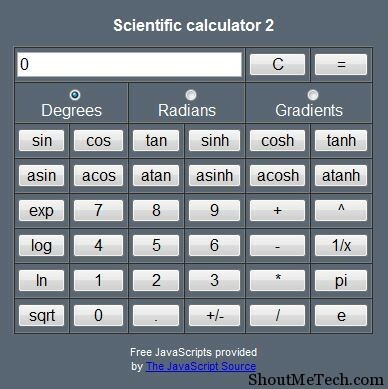 Thus, I’ll be listing the top 5 Free online Scientific calculator that you can use for solving a tricky set of problems. 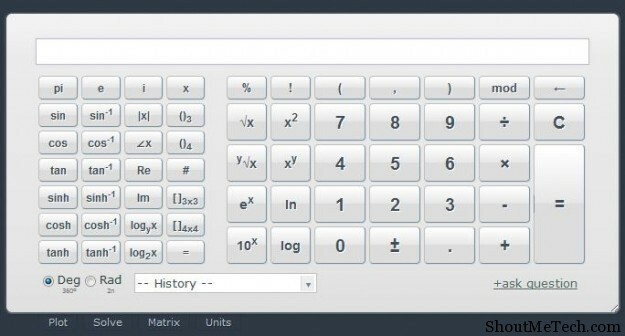 Though I’m listing many of such online calculators but my favorite among them is Web 2.0 Calc and Calculator-tab. Read on for complete list. This online calculator has the normal version as well as the scientific one. It has three different types of scientific calculators, a simple one that chemists use, one for higher mathematical equation solving and another that has extra functions like Memory, currency converter etc. You can select any one of them based on your requirements. Try it here. 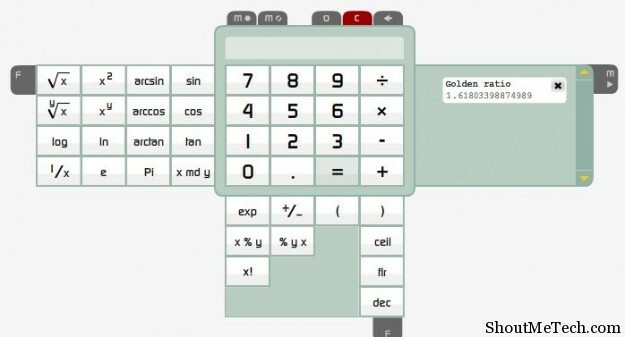 Another nicely made online calculator. Web 2.0 calc doesn’t have the variations like the one that I mentioned above, but it will get your work done. It’s nicely laid out for easy access and if you don’t get an answer, use the Ask a question option to get answers from others using the calculator. It also has a converter that can be used for various units. Try it here. A scientific calculator that doesn’t look scientific. With a simple UI and big buttons, this one can be used very easily to solve various problems. If you don’t want to use the online version, but you really like it, then you can download it to your desktop or mobile phone. ECalc is available for Windows, Mac and iPhone other than the standard web version. Try it here. In my opinion, Calculator-tab is the best looking scientific calculator, there could be better, but this ones sleek and stylish. You can solve basic trigonometric, algebraic and other kinds of problems using Calculator Tab. You can also open it as a pop-out and it also has keyboard input, so you don’t have to use your mouse. Try it here. Simple and fast. You can use both keyboard input as well as mouse to solve advance mathematical problems and scientific calculations. Basic algebraic and trigonometric problems and equations can be solved with the help of this. I would say, that this is the simplest of them all, but very effective at the same time. Try it here. These are the best free online scientific calculators that you can use on the internet. Some of them even have desktop and mobile apps to offer, but as long as you’ve got a good browser and in a hurry, these online resources should be plenty. Try them out and give us your opinions. Did they help you solve that complex math calculation?